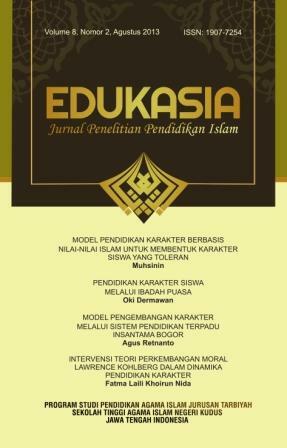 EDUKASIA (P-ISSN : 1907-7254 ; E-ISSN : 2502-3039) is the Islamic Educational Research Journal published every six months in February and August by the Islamic Education Program of STAIN Kudus. EDUKASIA has got “B” Accreditation from the Ministry of Research, Technology and Higher Education Number: 36a /E/KPT/2016 on May 23, 2016. This periodical scientific publication media presents the results of recent research in the field of Islamic Education. Editors receive articles ranging from educators, observers, researchers around the world for publication after having a rigorous selection, bestari partners’ review, and the editing process led by Editor In Chief.